In this paper, we analyze the seismograms of a local earthquake (M W = 5.8) and find a clear surface wave excitation at the northern edge of the Kanto Basin, Japan. To conduct three-dimensional (3-D) finite difference method simulations for this observation, we investigate the characteristics of the S wave velocity in the Kanto Basin and construct a realistic sedimentary structure model. The S wave velocities derived from the vertical seismic profiling measurements in the Kanto Basin show smooth depth gradients rather than step-like increases and can be successfully modeled by an exponential asymptotically bounded velocity function. Our simulation using the modified Japan integrated velocity structure model by incorporating a sedimentary layer with S wave velocity-depth gradients well reproduces the excitation and dispersion of the observed surface waves. This result indicates that realistic modeling of the impedance contrast at the sediment-bedrock interface is indispensable for the precise evaluation of surface wave excitation at the basin edge. Long-period ground motions in the predominant periods ranging up to 10 s are frequently observed in the Kanto Basin, Japan for shallow local earthquakes (e.g., Yamanaka et al. 1989; Kinoshita et al. 1992; Sato et al. 1999; Koketsu and Kikuchi 2000). The excitation of surface waves at the edge of a sedimentary basin owing to the incidence of S waves of shallow local and/or regional earthquakes has been reported by many researchers (e.g., Kawase and Aki 1989; Hatayama et al. 1995). 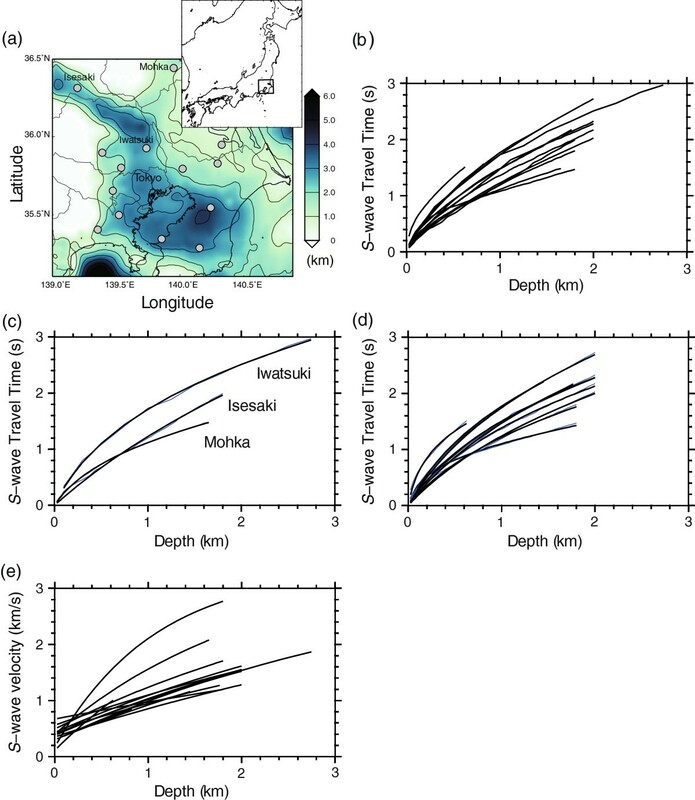 Furumura and Hayakawa (2007) found that the surface waves excited at the northern edge of the Kanto Basin by the 2004 Niigata-ken Chuetsu earthquake (M W = 6.6) propagated toward the southern part of the basin and caused large, long-period ground motions with a predominant period of approximately 7 s in Tokyo. This observation indicates that the study of surface wave excitation at the basin edge is important for the precise evaluation and prediction of long-period ground motion and disaster mitigation in the Tokyo metropolitan area. Because the long-period ground motions are caused by the surface waves developed in the sedimentary basin, the study of the basin structure is necessary for gaining a better understanding of the observed phenomena. However, the heavily urbanized state of the Tokyo metropolitan area and the complex shape of the bedrock (seismic basement) resulting from the active tectonics in the Kanto region have prevented the rapid advance of such studies. Using extensive geophysical datasets from refraction/reflection experiments, gravity surveys, microtremor surveys, etc., Koketsu et al. (2008) proposed the Japan integrated velocity structure model (JIVSM) as a regional three-dimensional velocity structure model of Japan, including the complex Kanto Basin structure. 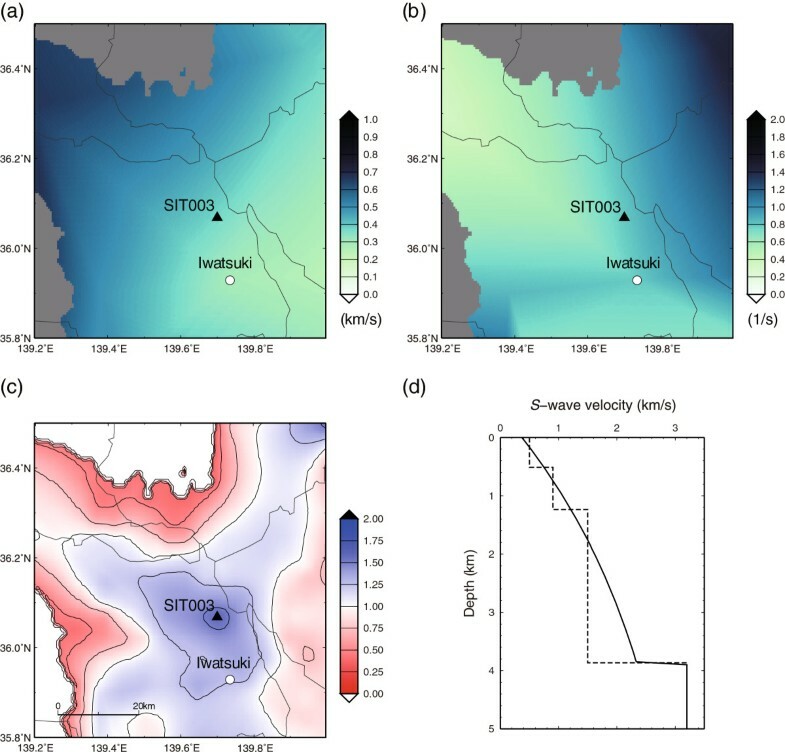 Although the JIVSM is one of the latest and most widely used structure models for the evaluation of strong and long-period ground motions of local and/or regional earthquakes, this model has room for improvement, especially in the deterministic evaluation of the surface waves observed in the Kanto Basin. In this study, we discuss the significant structural properties that control surface wave excitation at a basin edge on the basis of three-dimensional (3-D) finite difference method (FDM) simulations. In this process, we investigate the characteristics of the S wave velocity in the Kanto Basin and find that the S wave velocity in the sediment shows a smooth depth gradient rather than the step-like increase assumed in conventional layered structure modeling. Our analysis indicates that the S wave velocity-depth gradient is well represented by an exponential asymptotically bounded velocity function (Ravve and Koren 2006). Adopting this function, we modify the JIVSM and propose a 3-D structure model that accurately reproduces the amplitudes and dispersions of the surface waves observed in the northern edge of the Kanto Basin. The Kanto Basin spreads over an area of approximately 10,000 km2 in central Japan, with a sediment-bedrock interface locally deeper than 5 km (Figure 1a). The characteristics of seismic wave propagation in the basin sediment have been investigated at the seismological observation wells of the National Research Institute for Earth Science and Disaster Prevention (NIED) by the vertical seismic profiling (VSP) method (e.g., Yamamizu 19962004). Figure 1b shows the one-way travel time of S waves from the surface to a certain depth (depth-time curve) obtained at 14 wells of the NIED. The slopes of the depth-time curves correspond to the reciprocals of S wave velocity. Despite the local variation in the depth-time curves, this figure shows that the curves are smooth enough to suggest a continuous increase in S wave velocity with depth at all sites. This observation indicates that the conventional layered structure modeling of S wave velocity is not appropriate for the Kanto Basin. Map of Kanto Basin, one-way travel time of S waves, best-fitting model functions, and depth variations of S wave velocities. (a) Map showing the Kanto Basin and the locations of 14 seismic observation wells (gray circles), where VSP measurements were carried out. The local variation of sediment-bedrock interface depths from the JIVSM is shown by color gradations. (b) One-way travel times of S waves from the surface to certain depths obtained by VSP measurement at 14 wells (Yamamizu 19962004). (c) Best-fitting exponential asymptotically bounded velocity functions (black lines) to the VSP observations at the Isesaki, Iwatsuki, and Mohka wells (blue lines). (d) Best-fitting exponential asymptotically bounded velocity functions (black lines) to the VSP observations at other wells (blue lines). (e) Depth variations of S wave velocities at 14 wells evaluated by the best-fitting exponential asymptotically bounded velocity functions. Equation 2 can be directly applied to the results of the VSP measurements in the S wave velocity structure modeling. Because the S wave velocity in the sediment approaches the value in the bedrock as depth increases, we assumed ΔV = 3.2 km s−1 by referring to the JIVSM in our least squares regression analysis. Figure 1c shows the best-fitting functions for the three wells close to the northern edge of the Kanto Basin. The result agrees well with the observed depth-time curves, except for the very shallow part of the Isesaki well. Similar results obtained at other wells (shown in Figure 1d) confirm that the exponential asymptotically bounded velocity function is practically useful for modeling the S wave velocity structure of the sedimentary basin. Figure 1e shows the depth variations of S wave velocities at all wells analyzed in this study. An increase in nonlinearity in the S wave velocity with increasing depth can be clearly seen in this figure. Based on the findings above, we construct an S wave velocity model for the Kanto Basin. In consideration of the large local variations, we do not adopt an averaging method but rather a linear interpolation method to estimate sedimentary S wave velocities over the target area. Figure 2a,b shows the local variations in V0 and α, respectively, estimated for the northern edge of the Kanto Basin. The values in the area are characterized mainly by the VSP observations at the Isesaki, Iwatsuki, and Mohka wells. An artificial boundary seen at the southwestern part of Figure 2b is due to the coarse distribution of VSP observation wells and may not affect our discussions in this article. Local variations in V 0 , α , and ratio of sedimentary S wave velocity, and S wave velocity structure models. (a) Local variations in V0 estimated around the northern edge of the Kanto Basin. (b) Local variations in α. (c) Local variations in ratio of sedimentary S wave velocity just above the bedrock of the modified JIVSM to that of the JIVSM. (d) S wave velocity structure models beneath SIT003 from the JIVSM (dashed line) and modified JIVSM (solid line). To construct a velocity structure model for 3-D FDM simulations, we modify the JIVSM by discarding three sedimentary layers and incorporating a sedimentary layer with the S wave velocity-depth gradients estimated above. The P wave velocity and the density of the sediment are estimated using empirical relation data obtained from the Ministry of Education, Sports, Culture, Science and Technology (2007) and Shiomi et al. (1997), respectively. Anelastic attenuation Q values of the sediment are taken from the JIVSM as is, allowing for depth-dependent anelastic attenuation. Data for other structures beneath the sediment, including the bedrock, subducted oceanic plates, and mantle, are also taken from the JIVSM. We hereafter refer to the velocity structure model constructed in this study as the modified JIVSM. Using the velocity structure model constructed in the previous section, we conduct 3-D FDM simulations of seismic wave propagation to examine the influence of the sedimentary velocity structure on the surface wave excitation at the basin edge. The computations were conducted on the Earth Simulator (super computer) at the Japan Agency for Marine-Earth Science and Technology Center. The model of the 3-D simulation covers an area of 320 km × 220 km horizontally and depth of 64 km, which is discretized by a grid interval of 0.1 km horizontally and 0.05 km vertically. To perform an effective simulation, we employ a parallel 3-D FDM simulation code based on a domain partitioning procedure that utilizes a large number of processors with the message passing interface (MPI) (e.g., Furumura and Chen 2004; Maeda and Furumura 2013). The seismic source in northern Tochigi Prefecture, corresponding to the seismic activity that occurred on February 25, 2013 at a depth of 8 km, is used in this simulation. A focal mechanism of strike/dip/rake = 168°/86°/−10° and a moment magnitude of M W = 5.8 are assumed by referring to the centroid moment tensor (CMT) solution of F-net. A source time function represented by the asymmetric cosine function (Ji et al. 2003) with t s = 0.3 and t e = 2.7 is adopted as a point seismic source. After the calculation, the value of the seismic moment is adjusted to 77% of the CMT estimation to explain the observed waveform amplitude of a rock site (TCG011, shown in Figure 3c). 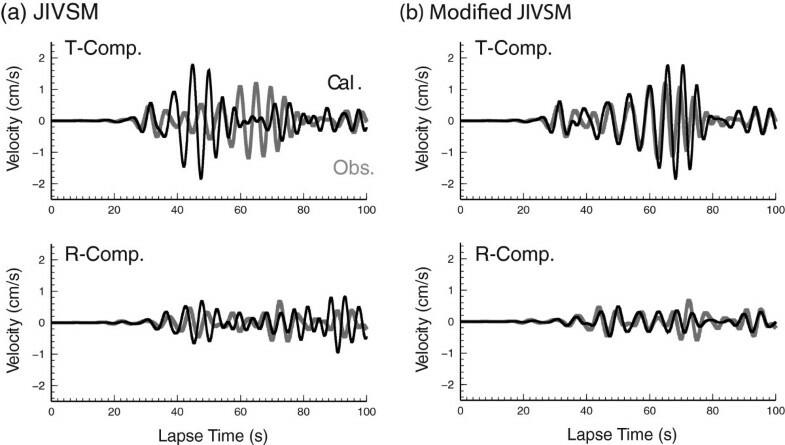 Comparison between simulated and observed velocity seismograms of transverse component: (a) JIVSM, (b) modified JIVSM, and (c) observations. A band-pass filter with a pass-band of 0.125 to 0.25 Hz is applied. Each trace is magnified by a factor proportional to the hypocenter distance to enlarge seismogram amplitudes at far stations. An inset map in (c) shows the locations of the epicenter and the observation stations, and the local variation of sediment-bedrock interface depths from the JIVSM. Figure 3 shows record sections of transverse (T) component seismograms derived from simulations and dense array observation. A band-pass filter with a pass-band of 0.125 to 0.25 Hz is applied to extract surface waves with a predominant period of approximately 7 s, and each trace is multiplied by the hypocenter distance to enlarge seismogram amplitudes at far stations. Because of the strong SH wave source radiation in the direction of the Kanto Basin, large-amplitude SH waves are expected in the T component. At hypocenter distances of less than 60 km, simulation results from the JIVSM and the modified JIVSM are in good agreement with the waveforms observed by the KiK-net and K-NET of the NIED. This indicates that the modeling of the source and the velocity structure of the crust and uppermost mantle are appropriate for calculating the seismic wave propagation in this frequency range. As the hypocenter distances exceed 70 km, source-radiated body waves enter the Kanto Basin, and excitation of surface waves (Love waves) occurs at the edge of the basin. The simulated and observed seismic waves show strong amplification by the low-velocity sediment as they propagate toward the inner part of the Kanto Basin. The amplitude of the Love waves derived from the simulation using the JIVSM (Figure 3a) is much larger than that observed (Figure 3c). The JIVSM predicts strong excitation and development of the Love waves, and an unrealistically large wave packet appears at SIT010. Meanwhile, the amplitude of the Love waves derived from the simulation using the modified JIVSM (Figure 3b) is much closer to the observation, though it is still far from a perfect fit. Figure 4 shows a comparison of horizontal component waveforms at SIT003 as obtained from simulations and observations. SIT003 is located in the Kanto Basin, 30 km from the basin edge. It is clear that a dominant wave packet of Love waves in the T component appears significantly earlier in the simulation using the JIVSM than in the observation. The simulation result using the modified JIVSM (Figure 4b) drastically minimizes this inconsistency. Moreover, the amplitude and dispersion of the surface waves in both the T and the radial (R) components are well reproduced. 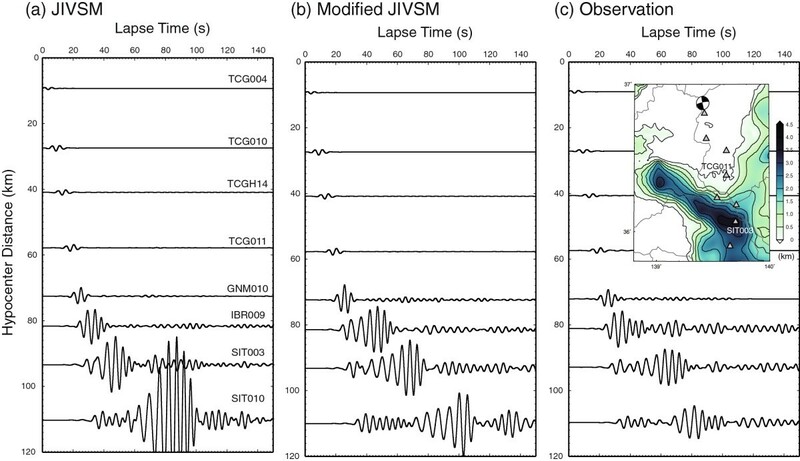 Comparison of simulated and observed horizontal seismograms at SIT003: (a) JIVSM and (b) modified JIVSM. The black and gray lines represent the simulation results and observations, respectively. Our 3-D FDM simulation using the modified JIVSM well reproduced the characteristics of the surface waves observed at the northern edge of the Kanto Basin in the frequency range of 0.125 to 0.25 Hz. In particular, the appearance of the dominant wave packet of Love waves was satisfactorily reproduced by introducing the velocity gradient of sediment into the JIVSM. Because the depth of the bedrock, which is supposed to be well constrained by refraction/reflection experiments (e.g., Hamada et al. 1990), was not modified in our simulations, the improvement in the reproducibility can be attributed solely to the modeling of the sedimentary structure. The dominant wave packet of Love waves recorded at SIT003 shows clear normal dispersion, indicating the propagation of this packet over a certain distance where arrival time differences of 40 s can be expected between the direct S waves and the Love waves. However, the simulated Love wave packet at SIT003 using the JIVSM precedes the corresponding wave packet in the observation by 20 s and shows very weak dispersion, implying Love wave excitation close to this station. Because the surface wave is excited by the trapping of the body wave energy in a low-velocity surface structure, the abovementioned discrepancy is most probably the result of inexact modeling of the impedance contrast at the sediment-bedrock interface. Figure 2c shows the local variation in the ratio of the sedimentary S wave velocity just above the bedrock of the modified JIVSM to that of the JIVSM. This ratio is relatively small at the extreme edge of the basin (within 15 km of the border), where the bedrock is not deeper than approximately 2 km; the ratio is conversely large in the inner part of the basin, where SIT003 is located. This observation indicates that the modified JIVSM has a higher potential to excite Love waves at the extreme edge of the basin than does the JIVSM. Figures 3b and 4b show that the dominant wave packets of the observed Love waves are well explained by the simulation using the modified JIVSM. This result strongly suggests that the Love waves are excited at the extreme edge of the basin and propagate toward the inner part of the basin with a group velocity of approximately 1 km s−1. To investigate the influence of the velocity gradient in the sediment on the surface wave propagation, we conducted additional 3-D FDM simulations using simple 1-D velocity structure models from the SIT003 site of the JIVSM and the modified JIVSM (Figure 2d). Although the figures are not shown here owing to space constraints, they confirm that no apparent difference exists between the two models in terms of the group velocity and the dispersion of the Love waves in the frequency range of 0.125 to 0.25 Hz. This result implies that the incorporation of the velocity gradient affects the surface wave excitation much more strongly than it affects the surface wave propagation at the basin edge in the analyzed frequency range. The results of this study indicate that a realistic velocity structure model is required to explain the excitation and propagation of the surface wave in the sedimentary basin. Our results also strongly suggest that the dominant wave packet of Love waves is excited at the extreme edge of the Kanto Basin and propagates toward the inner part of the basin. This finding indicates that the study of surface wave excitation at the extreme edge of the basin, including dense array observations, is quite important for the precise evaluation and prediction of long-period ground motion in the Tokyo metropolitan area. In this article, we showed a case study in which the realistic modeling of sedimentary velocity structure improved the geophysical reproducibility of the surface wave excitation at the basin edge; however, highly accurate modeling of the phase and amplitude of excited surface waves requires further study. It is obvious that the number of VSP measurements used in this study is insufficient to construct an accurate sedimentary structure model of the Kanto Basin. Concerning this matter, one needs to determine the local variation of the model parameters of the sedimentary structure (e.g., V0 and α of the S wave velocity) using geophysical analyses such as phase and group velocity analysis, spectral analysis, and a waveform inversion of surface waves of local and/or regional earthquakes. For a fully accurate model of the sedimentary structure, additional consideration on how to specify the relation among the various structural parameters, including an anelastic parameter, may be required. We acknowledge the National Research Institute for Earth Science and Disaster Prevention (NIED), Japan for providing the KiK-net and K-NET waveform data and CMT solutions from the F-net. The computations were conducted on the Earth Simulator at the Japan Agency for Marine-Earth Science and Technology Center (JAMSTEC) under the support of a joint research project entitled ‘Seismic wave propagation and strong ground motion in 3-D heterogeneous structure’ of the Earthquake Research Institute, the University of Tokyo and the Earth Simulator Center. We thank two anonymous reviewers for their thoughtful reviews of this article. Some figures in this article were drawn using the Generic Mapping Tools (GMT) software package. KY carried out the modeling of the sedimentary structure of the Kanto Basin and drafted the manuscript. ST conducted the finite difference simulations and waveform analysis, and helped draft the manuscript. Both authors read and approved the final manuscript.